on April 4th at 6:30 p.m. with readings beginning at 7 p.m.
on Friday, 31st March at 4:30 p.m.
St. Jerome’s is located at 290 Westmount Road North, Waterloo, Ontario. We acknowledge the support of the Canada Council for the Arts, which last year invested $155 million to bring the arts to Canadians throughout the country. Pamela reads at 4-5:30 p.m.
Tue 8 November 2016 7:00 p.m.
On September 25 2016, Pamela reads at 12:45 – 1:30 p.m.
On June 11 2016 at 5:00 p.m.
Victoria Village Branch at 7:00 pm. North York Central Library – 2.00 – 3:00 p.m. Victory Café at 6:00 pm. Beit Zatoun at 6:30 pm. Red Jacket has been shortlisted for the Rogers Writers’ Trust Fiction Prize! Brooklyn, NY: Medgar Evers College, 1650 Bedford Ave, Brooklyn. Pamela read on June 6th as part of Word! A Caribbean Book Fest. To find out more about this event, please visit the Facebook event by clicking here. 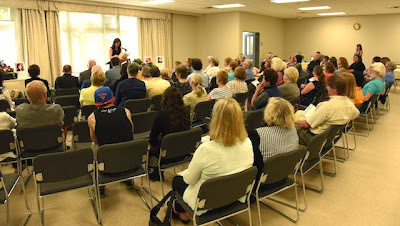 Bracebridge, ON: Pamela read at the meeting of the Bracebridge chapter of the Canadian Authors Association on June 18th. A brief discussion about the role of manuscript reviewers in the writing process followed her reading. Hamilton: Bryan Prince Bookseller, 1060 King St W, Hamilton, on May 27th, 2015. Pam read with authors Gary Barwin (garybarwin.com) and Christine Miscione (christinemiscione.wordpress.com). Guelph: On May 2nd, 2015, Pam was included in the inaugural Canadian Authors for Indies, a national initiative developed by Ann Marie McDonald. The event was designed to provide a forum for authors to promote books, assisting booksellers as well as their peers. More Information can be found at on the Canadian Authors for Indies website. Toronto: Ben McNally Books, at 366 Bay St, Toronto, on April 9th, 2015. Waterloo: Words Worth Books, at 96 King St. S, Waterloo, on April 2nd, 2015. On Wednesday, 25th March, Pamela read from Subversive Sonnets at “Culture, Identity and Representation,” an event to celebrate Black History Month at the Scarborough Campus of the University of Toronto. Spoken word poet, YusraKhogali Ali, drummer, Walter Maclean, dancer-choreographer, Ken A. Ormsby, director and dramaturg, Diane Roberts, poet, playwright and essayist, Charles Smith, and dancer-choreographer, Chris Walker also took part.